So, you’ve moved beyond teaching how to write a great sentence, into a solid paragraph and into an essay. 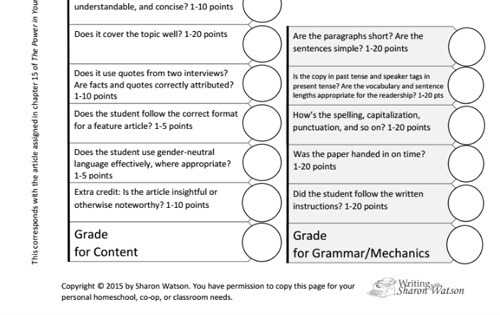 The next question is – How do you grade your student’s essay? 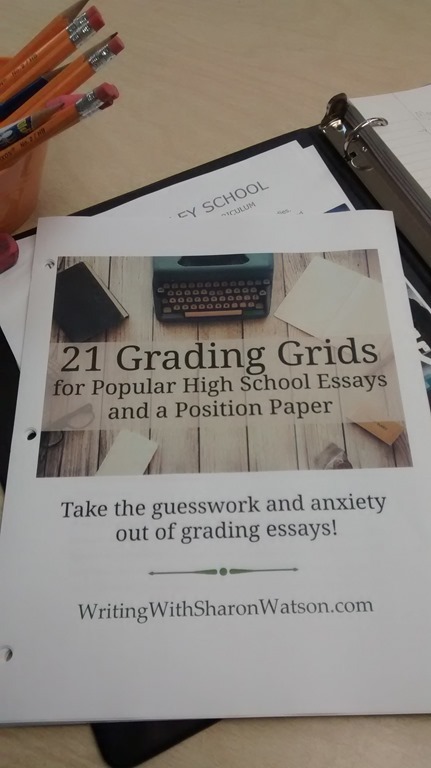 I am excited to share 21 Grading Grids for Popular High School Essays and a Position Paper created by Writing with Sharon Watson with you. These are found in the The Power in Your Hands: Writing Nonfiction in High School, 2nd Edition, and are pulled out as a stand alone. 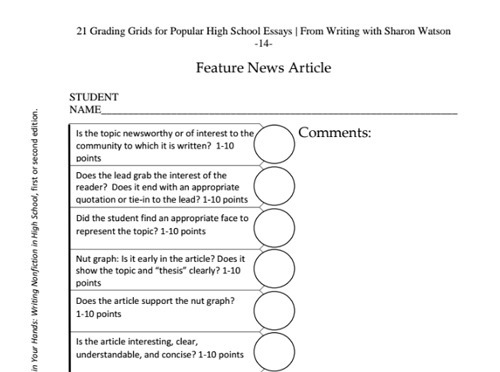 So – even if you haven’t used The Power in Your Hands: Writing Nonfiction in High School, you can still benefit with these grading grids. I printed out the pdf file for this digital product and put it in my teacher’s binder at work. My son has taken several writing courses in college the past two years and I have felt like I was winging it in grading his work. I also felt like a loss to help him with the different types of essays. I like that there are several different types of essays in this e-book! One of the grids that caught my eye is for Feature News Articles. Although this is focused on High School Essays, I am working in a differentiated classroom with many learning levels between 4th and 6th grade. I’m also helping my older son proofread his college essays, while teaching my 10th grader how to construct a solid essay. So I am looking at the grid in three ways. One – I want to challenge my 4th-6th grade class to add more detail to their current event reports given in class. 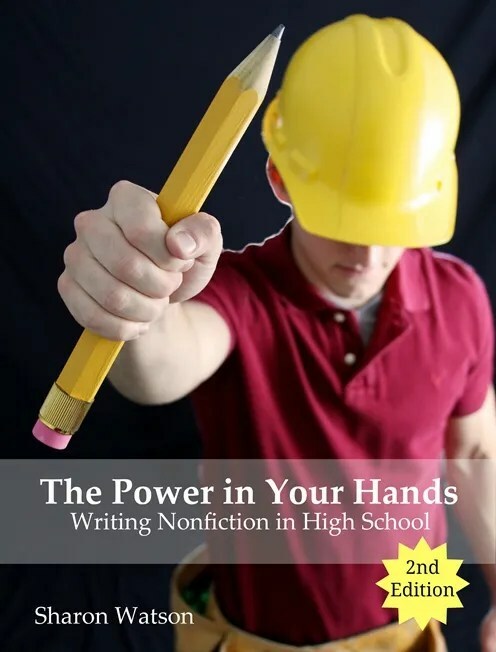 Two, I want to teach my 10th grader how to write a beefed up intentional essay, and I can coordinate it with lesson 15 in the Power in Your Hands book. Three, I can print the grid to my college son for him to self check his essay for his class. I am also looking at the Biography grid for my younger students, as this year they are participating in a Biography Ball and will write an oral report to accurately portray their character to their parents and visiting guests. I love the idea of using the Biography and Person of Influence Grid to help them stay on task and build layers to their presentation. I like the breakdowns of the Persuasive Essays. This would have been most helpful last year with Nate’s many essays. He has to write them, not only for WR classes, but for History, Biology, Health, and all of his other core classes. Many times, the term paper and project explanation are his final grade. Even in his college math class, his final was a project representing him using the math skills learned in a real life situation, and he had to write a paper to explain what he did using mathematical terminology. It’s the last day of class, you only have one shot before turning it in to help him evaluate his writing. 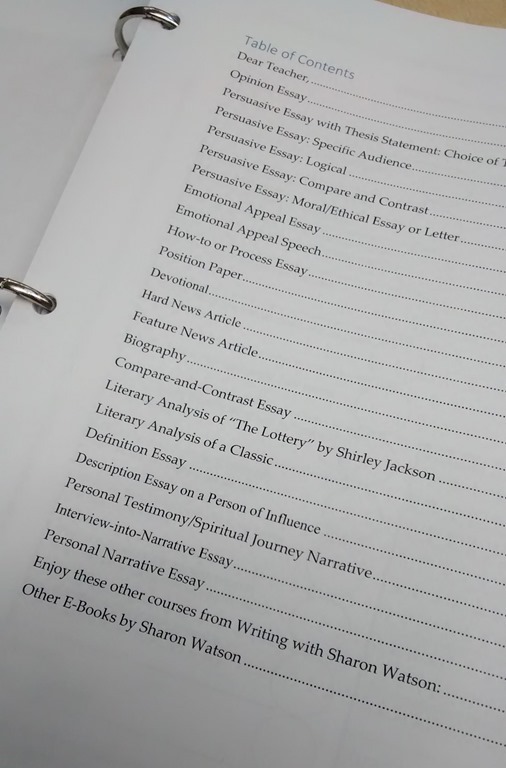 One thing that this experience of reviewing the share 21 Grading Grids for Popular High School Essays and a Position Paper is sparked the love of the The Power in Your Hands: Writing Nonfiction in High School. I have the 1st edition and used it several years ago. I need to look through it again for next year with Jon in 10th grade with is homeschool writing program, and to help me see the focus of the purpose in teaching writing compositions to the 4th-6th graders. 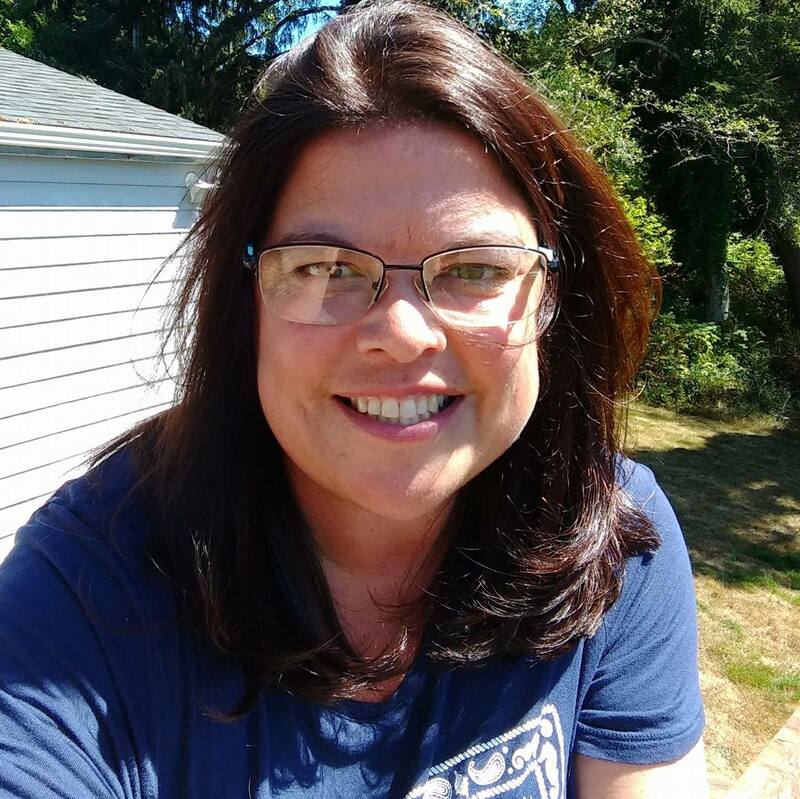 Writing with Sharon Watson also has other e-Books to help you out! 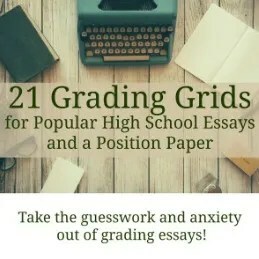 How would you use the 21 Grading Grids for Popular High School Essays and a Position Paper? You may click the banner below to see how my fellow crew members used their digital copy. 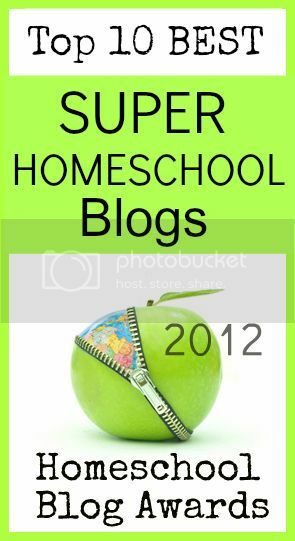 This entry was posted in Language, Literature, Schoolhouse Crew, Writing and tagged #hsreviews #highschoolwriting #writingcurriculum. Bookmark the permalink. Hi, Angie! Thank you for your review of 21 Grading Grids. I love it that you are using the grids in so many places and that you are adapting it to fit your needs. That’s what I hoped moms and teachers would do with them. A note about The Power in Your Hands: We came out with a 2nd edition when the SAT changed its essay parameters. If you use the first edition with your son, skip the SAT essay chapter. Have a wonderful year with your students and your son!